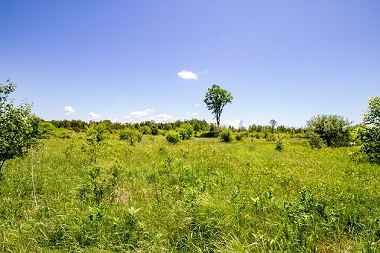 76.86 ACRES | 31.1 HECTARES of meadows, shade trees, & wetlands. Lots of fertile agricultural land in the eastern portion (once a beef farm) & wetland with surrounding wooded area in the western portion. A watercourse crosses the northern portion. Zoning is RU (Rural Countryside) + significant wetland is zoned EP3 (Environmental) - a birder’s paradise! A great piece of land for an equestrian facility or hobby farm with lots of pasture available. The lot hugs the curve of the road where Franktown Road meets Richmond Road – note that these are paved roads. Just south of the Village of Ashton, enjoy scenic commutes to larger centres such as Ottawa, Smiths Falls, Perth & Carleton Place. The lot offers a buildable area of 1.56 hectares, as can be seen in the drawing (the dashed portion). This is ado with a required 120m setback from any wetland area and also a setback from a nearby limestone resource (on an adjacent property, no extraction operation is underway or anticipated). DIRECTIONS: 417 West toward Carleton Place, south on Dwyer Hill Road, west on Franktown Road (MERGES with Richmond Road) to Ashton Station Road. Property on curve where merge occurs, on east side of Ashton Station Road.